Recent reports show a rise in self-reported hearing loss (HL) among patients in developing countries [1,2]. Further, this rise is reported with increase in age [3-5]. Possible causes for the rise include increased demand for communication, occupational and recreational noise  diabetes and other medical conditions and medications [2,3]. According to the World Health Organization (WHO), there are 360 million hearing impaired people globally accounting for 5.3% of the world’s population [6,7]. This ranks hearing impairment (HI) as one of the most common disabilities worldwide [8,9]. The WHO defines disabling HI as hearing worse than 40 dB in the better ear in adults and more than 30 dB in the better ear in children . In children, HI results in difficulties in communication, a delay in language development, economic and educational underachievement and social deprivation [11-14]. Isolation, frustration and early dependency are the main consequences of HI in adults . Experienced clinicians understand that complaints about HI among patients does not always necessarily correlate with abnormal audiograms [15-17]. While pure tone audiograms are considered gold standard for assessment of hearing levels [17,18], this becomes cumbersome to implement especially in rural areas and countries with limited budgets . To overcome this challenge, tools for self-reported HI assessment have been developed and validated . In Rwanda, hearing difficulties are a common cause for consultation with an otolaryngologist. However, published epidemiological data on deafness and HI in relation to both prevalence and incidence are not available at this time owing to shortage of trained personnel in the field and lack of facilities to assess patients. However, charity organizations donate hearing aids to patients with self-reported HI, in many cases without insisting on a validated diagnosis. Against this context, we conducted a study to find out etiologies of HL as reported by those affected, age at onset of HL, duration from onset of HL and presentation to seek medical assistance. We also explored factors reported to cause late presentation for health seeking. The study was a cross-sectional descriptive study whose setting was a free and open ear camp where people perceiving themselves as HI turned up voluntarily to receive a donation of hearing aids. Subjects were patients aged above 4 years who presented in the open and free ear camp with perceived or confirmed HL seeking to receive hearing aids and who consented to be included in the study. The free ear camp was held in an open space at a stadium. A voice test as described by Pirrozzo et al. was conducted on all patients who perceived them to have hearing loss . The ear camp was organised in stations whereby only patients who failed the voice test proceeded to the fitting station . It is this group of patients that were included in our study. None of these patients denied consent to participate in the study. Data was collected using a questionnaire predesigned for this study. Variables of interest included age of the subject, gender, age at onset of HL, duration before presentation to seek medical assistance at the camp, type and source of treatment if ever sought, presence of HI in the family and perceived cause of HL. Severity of HL whether subjective or objective was not documented. Data was entered and analysed under STATA 13. Ethical approval was obtained from Department of Medical Research of Rwanda Biomedical centre and addressed to those giving hearing aids to patients. Participation in the study was voluntary and no participant was no jeopardized for not being involved or not willing to enrol in the study. A consent form was given to each participant or guardian (in case of a child less than 18 years) and he/she signed voluntarily. The study enrolled 129 patients. Their mean age was 30.55 years (SD =18.15, range 6-80 years). Males accounted for 57% (n=74) of respondents giving a ratio of 3:2. The highest proportion of people reporting HL was in the age group of 16- 30 years accounting for 34% while those above 60 years had the lowest proportion of 8%. Majority of the respondents were farmers 43% (n=56), while students ranked second at 25% (n=32). Unemployed people accounted for 23% (n=29). All the respondents had a medical cover; 93% (n=120) being affiliated to the community based health insurance of Rwanda. Table 1 shows that majority of respondents reported that onset of their HL was when they were <5 years of age and 5-15 years of age accounting for 37% (n=48) and 38% (n=49) respectively. Table 1: Distribution according to age group at onset of hearing loss. Sixty four percent (n=83) reported that they had suffered from other diseases before developing symptoms of HL. Only 13% (n=17) reported that the cause was unknown. Other reported causes include noise and head injury in 2% (9) respondents (Figure 1). 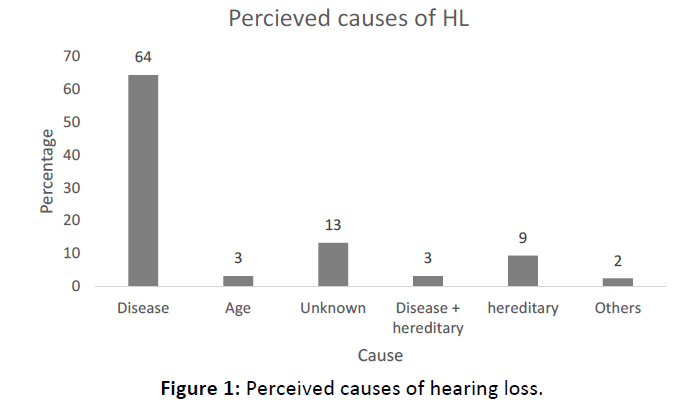 Figure 1: Perceived causes of hearing loss. The main diseases reported to have caused HL include ear infections and meningitis in 47% (n=46) and 29% (n=28) respectively (Figure 2). Other diseases included measles, neonatal jaundice and mumps. Figure 2: Disease that caused hearing loss. While 17% (n=22) respondents reported a positive drug history preceding onset of their HL, they could not specify the drug they perceived to have caused it. However, 7% (n=9) took traditional herbs. The majority of respondents affirmed that they did not take any drugs that could have caused HL. The number of participants is too small to make concrete comparisons to other reported topics like infection. Figure 3 shows that only 37% (n=48) respondents sought treatment within 6 months of onset of HL. The biggest proportion; 33% (n=42) reported that they sought treatment after 1-5 years of onset of HL while 19% (n=24) sought treatment more than 10 years after onset of their HL. Figure 3: Duration from onset of symptoms to seeking treatment. Sixty two (48%) of respondents reported lack of awareness as the reason for delays in seeking treatment. Moreover, seeking traditional treatment first and the slow-progressing nature of onset of HL were the other common reasons for delays, which accounted 11% (n=14) and 10% (n=13) respectively. Lack of money was a barrier in 9% (n=11) of respondents (Figure 4). 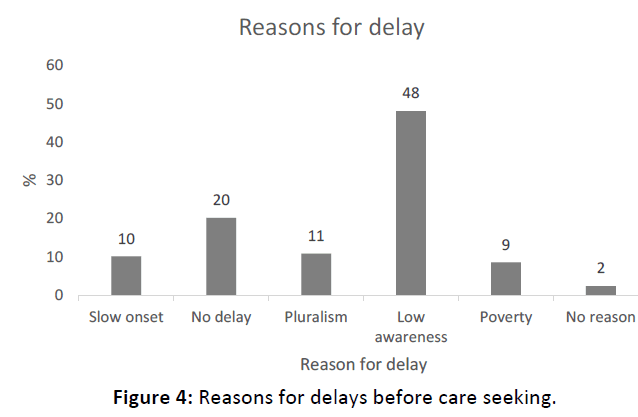 Figure 4: Reasons for delays before care seeking. This is the first study in Rwanda looking at perceived causes of HL. Similar to our study, Kodiya et al. in their study regarding the burden of HL in Kaduna, Nigeria, found overall prevalence of HL was higher in males (56.7%) than in females (43.4%). This could be explained by the proportion of men who managed to attend the camp given distance and transport barriers that most likely excluded women . While majority of respondents were in the age range of 16-30 years, most respondents reported onset of HL at the age of 0-5 and 5-15 years. Moreover, ear diseases and meningitis were the main causes of HL reported a finding reported by other studies . This finding is in agreement with studies that show that children are at higher risk of get HL from chronic ear infections especially in low and middle income countries [10,14,24]. 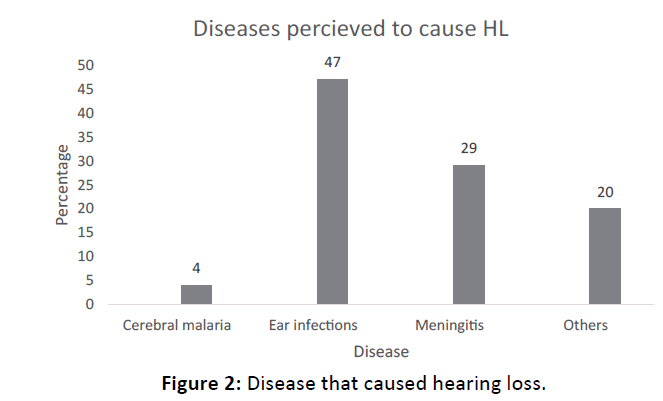 Similar to our study, many studies have shown that chronic ear infections account for the greatest proportion of HL especially in developing countries [10,14,23,25-28]. Karanja et al. found that 36 of 83 (44.4%) children with bacterial meningitis had varying degrees of HL attributed to meningitis . Minja et al. in his study done in Buguruni school of deafness similarly concluded that meningitis represented 23.9% of causes of deafness while otitis media accounted for 8.8% of cases30. This study was carried out in a school for the deaf where those placed in these schools are more likely to have sensorineural HL different from conductive HL seen among patients suffering from chronic ear infections. Cerebral malaria accounted for 3% (n=4) of causes of HL in our study. This concurs with findings from different studies where cerebral malaria is documented to cause varying degrees of sensorineural HL [31-33]. However, these authors did not indicate the different degrees of HL. Heredity is a perceived cause of HL revealed by this study. Although higher than in our study, Yelverton et al, in their study of 371 children with confirmed unilateral HL concluded that a family history of permanent childhood HL was present in 24 children (21.8%) . The role of heredity is reported in other studies as well [35-37]. In the same token, the onset of deafness was congenital in 10.2% of pupils in a School for the Deaf in Dar-es-salaam, Tanzania . Reports from South Africa show that 4 to 6 in 1000 live births have HL . Extrapolating from this report, it is likely that heredity did truly account for HL among our respondents. Ototoxic effects of drugs are well described in literature [2,26]. Our study found that although many respondents reported they could not recall the drugs they used which caused their HL, unspecified traditional herbs and quinine were reported to have caused HL in a small proportion of respondents. We cannot conclude beyond reasonable doubt that all patients who had positive drug history had otoxicity. Nonetheless, the study done in Buguruni School for the Deaf in Dar-es-Salaam, Tanzania reported that ototoxicity was detected in 20.8% [36,38] while Dunmade et al. reported it in 3.5% (n=115) deaf children . However, our number of cases is too small to see any correlation between positive drug history and reporting of infection in the history. Studies in Asia and Africa show that people still prefer alternative therapy to conventional treatment. Factors associated with this practice include, lack of awareness and ignorance among others [41-44]. Our study found that patients tend to seek treatment long after they developed symptoms and a big proportion first seeks treatment with traditional healers before they finally visit a health facility. 80% of respondents sought treatment after 6 weeks of onset of HL and reported having sought traditional treatment before visiting a health facility. Considering majority of the respondents held a medical cover, financial constraints are unlikely to be the reason for not seeking treatment. Rather, lack of awareness could be the main barrier and this was reported by 49% of respondents. This supports the hypothesis ignorance is the main reason for delayed care seeking whereas lack of money is a barrier in only a few cases due to the relatively good public health system in Rwanda. This study included subjects who reported perceived HL and was looking at their perceptions with regards to the cause of their HL as well as health seeking preferences. While some of them had confirmed HL with audiograms, this was not the criteria for inclusion and therefore severity of HL was not considered. We did not have a control group to compare results and could not therefore make inferences beyond descriptive statistics. Hearing impairment is still a common problem among the young people of school going age and usually beginning early in childhood in developing countries like Rwanda. In agreement with literature, those affected by HI attribute it to ear infections, meningitis, malaria, noise and ototoxicity among others. Traditional treatment is still a preferred source of help and ignorance remains a big barrier for timely care seeking. More effort is required to increase public awareness about ear health; prevention, causes and management of HI. Further studies to assess and ascertain causes of HL are recommended. Thanks to The Starkey Hearing Foundation for allowing us to collect data from patients who turned up to receive hearing aids during their Phase II mission in Kigali. Pierre PV (2012) Self-reported hearing difficulties, main income sources, and socio-economic status; a cross-sectional population-based study in Sweden. BMC Public Health 12: 1. Lasisi AO, Abiona T, Gureje O (2010) The prevalence and correlates of self-reported hearing impairment in the Ibadan study of ageing. Trans R Soc Trop Med Hyg 104: 518-523. Cruickshanks KJ (1998) Prevalence of hearing loss in older adults in Beaver Dam-Wisconsin the epidemiology of hearing loss study. Am J Clin Nutr 148: 879-886. Davis A, Davis KA (2010) Epidemiology of aging and hearing loss related to other chronic illnesses. Hearing Balance Commun 16: 7-8. Ramkissoon I, Cole M (2011) Self-reported hearing difficulty versus audiometric screening in younger and older smokers and nonsmokers. Int J Clin Med 3: 183-190. Mathers C, Smith A, Concha M (2000) Global burden of hearing loss in the year 2000. World Health Organization. Fact sheet N°300 Updated 2014. Olusanya BO (2007) Addressing the global neglect of childhood hearing impairment in developing countries. PLoS Med 4: 74. World Health Organization, Preventing chronic diseases: a vital investment 2005: Geneva. World Health Organization, Fact sheet N°300 Updated 2014. Mathers C, Smith A, Concha M (2000) Global burden of hearing loss in the year 2000. Global burden of Disease 18: 1-30. Abdalla FM, Omar MA (2011) The role of the health system in the prevention of hearing loss among children in Sub-Saharan Africa. Sudan J Paediatr 11: 8-19. Storbeck C (2012) Childhood hearing loss in the developing world. Int. J. Child Health Nutr 1: 59-65. TaYlor B, Manchaiah V, Clutterbuck S (2016) Using the personal assessment of communication abilities (PACA) Tool. Hearing Review 23: 20. Tremblay KL (2015) Self-reported hearing difficulties among adults with normal audiograms: The Beaver Dam offspring study. Ear Hear 36: 290. Plack CJ, Barker D, Prendergast G (2014) Trends Hear 18: 2331216514550621. Sindhusake D (2001) Validation of self-reported hearing loss. The blue mountains hearing study. Int J Epidemiol 30: 1371-1378. Shrestha BL, Amatya RCM (2014) Correlation of numeric rating scale with pure tone audiogram for assessing hearing loss. Bangladesh j. med. sci 13: 25. Pirozzo S, Papinczak T, Glasziou P (2003) Whispered voice test for screening for hearing impairment in adults and children: systematic review. Bio med j 327: 967. Larsen JB (2016) A Community-based hearing healthcare model and the WFA fitting method. Hearing Review 16: 52-55. Kodiya AM, Afolabi OA, Ahmad BM (2012) The burden of hearing loss in Kaduna, Nigeria: A 4-year study at the National Ear Care Centre. Ear Nose Throat J 91: 156-63. Acuin J (2004) Chronic suppurative otitis media: burden of illness and management options. World Health Organization, Geneva. Smith AW (2001) WHO activities for prevention of deafness and hearing impairment in children. Scand Audiol Suppl 53: 93-100. World Health Organization: Report on International workshop on Primary Ear and Hearing Care 1998, Cape Town, South Africa. World Health Organisation: Report of an informal consultation on strategies for prevention of hearing impairment from ototoxic drugs 1994. Olusanya BO, Neumann KJ, Saunders JE (2014) The global burden of disabling hearing impairment: A call to action. Bull World Health Organ 92: 367-73. Benson J, L Mwanri (2012) Chronic suppurative otitis media and cholesteatoma in Australia's refugee population. Aust Fam Physician 41: 978-80. Karanja BW (2014) Prevalence of hearing loss in children following bacterial meningitis in a tertiary referral hospital. BMC Res Notes 7: 138. Minja B (1998) Aetiology of deafness among children at the Buguruni School for the deaf in dar es salaam, Tanzania. Int. J. Pediatr. Otorhinolaryngol 2: 225-231. Schmutzhard J (2015) Severe malaria in children leads to a significant impairment of transitory otoacoustic emissions--a prospective multicenter cohort study. BMC Med 13: 125. Idro R (2010) Severe neurological sequelae and behaviour problems after cerebral malaria in Ugandan children. BMC Res Notes 3: 104. Sowunmi A (1997) Clinical study of cerebral malaria in African children. Afr J Med Med Sci 26: 9-11. Yelverton JC (2013) Risk factors associated with unilateral hearing loss. JAMA Otolaryngol Head Neck Surg 139: 59-63. Driscoll C (2015) The validity of family history as a risk factor in pediatric hearing loss. Int. J. Pediatr. Otorhinolaryngol 79: 654-659. Della VA (2016) Follow-up of permanent hearing impairment in childhood. Acta Otorhinolaryngologica Italica 36: 60. Parker M, Bitner-Glindzicz M (2015) Republished: genetic investigations in childhood deafness. Post med j 91: 395-402. Minja BM, Moshi NH, Riwa P (2003) Noise induced hearing loss among industrial workers in Dar es Salaam. East Afr Med J 80: 298-302. Copley GJ, Friderichs NB (2010) An approach to hearing loss in children. SA Fam Pract 52: 34-39. Dunmade A (2007) Profound bilateral sensorineural hearing loss in Nigerian children: any shift in etiology? J Deaf Stud Deaf Educ 12: 112-118. Chukuezi C, Chukuezi A (2009) Myths and beliefs in aetiology and treatment of ear, nose and throat diseases amongst the igbo of Nigeria. Int. J. Pediatr. Otorhinolaryngol 11: 2. Rupa V, Jacob A, Joseph A (1999) Chronic suppurative otitis media: prevalence and practices among rural south Indian children. Int J Pediatr Otorhinolaryngol 48: 217-224. Lasisi AO, Ajuwon JA (2001) Beliefs and perceptions of ear, nose and throat-related conditions among residents of a traditional community in Ibadan, Nigeria. Afr. J.Med. med Sci 31: 49-52. Mukara KB (2017) Knowledge and care seeking practices for ear infections among parents of under five children in Kigali, Rwanda: A cross-sectional study. BMC Ear Nose Throat Disord 17: 1.